At the end of your turn, if you have a creature with 5 power or more, draw a card. Ash Berserker is a rare Strength creature card. It is part of the Houses of Morrowind expansion. 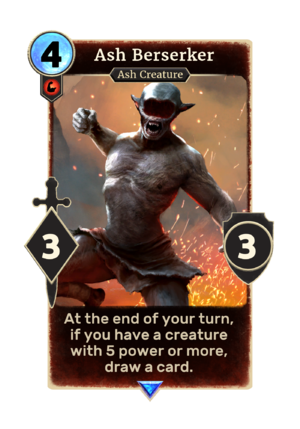 In addition to the card's availability in the Houses of Morrowind expansion, two copies are included in the Dagoth's Might theme deck. This page was last modified on 13 December 2018, at 14:10.